Saturn's new diffuse ring, coincident with the orbits of Saturn's moons, Janus and Epimetheus. 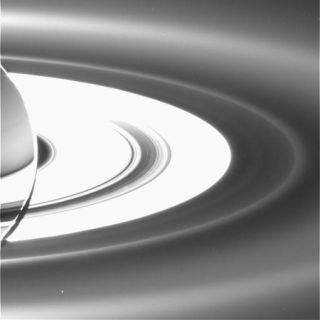 Saturnshowed off a newring in a snapshot just taken by NASA's Cassini spacecraft. Thespacecraft, which entered the orbit of Saturnin July 2004, also revealed other dazzling features of the ringed planet,including wispyfingers of icy material stretching out tens of thousands of miles from themoon Enceladus. Cassini's cameras took advantage of a 12-hour backlight provided by the Sun,which was directly behind Saturn. So as Cassini lurked in the shadow of Saturn,the planet's rings were brilliantly backlit by the passing Sun. Called a solaroccultation, this Sun-Saturn alignment typically lasts only about an hour, butthis time it was a half-day marathon. The lengthyillumination of Saturn allowed Cassinito map the presence of microscopic particles that are not normally visibleacross the ring system. This level of detail gave astronomers the sharpest viewyet of Saturn's inner system, including the new ring. Saturn'sring system is divided into seven main divisions, each designated by aletter of the alphabet. From the innermost to outermost ring, the divisionsare: D, C, B, A, F, G and E.
The newring is a tenuous feature and lies outside the brighter main rings of Saturn,but inside the G and E rings. The ringcoincides with the orbits of Saturn's moons Janus and Epimetheus. Scientistsexpected meteoroid impacts on the two moons could kick off moon particles andinject them into Saturn's orbit. But they were surprised to find such adistinct ring structure in that region. The 12-hourbacklight session enabled astronomers to see the entire E ring in one view, afeat that previously required several images of small sections of the ring. Thesnapshot showed Enceladussweeping through the E ring, extending wispy, fingerlike projections into thering. The scientists suspect the 'fingers' consist of tiny ice particles beingejected from Enceladus'south polar geysers and into the E ring. "Boththe new ring and the unexpected structures in the E ring should provide us withimportant insights into how moons can both release small particles and sculpttheir local environments," said Matt Hedman, a researcher working withteam member Joseph Burns, an expert in diffuse rings, at Cornell University inIthaca, N.Y.